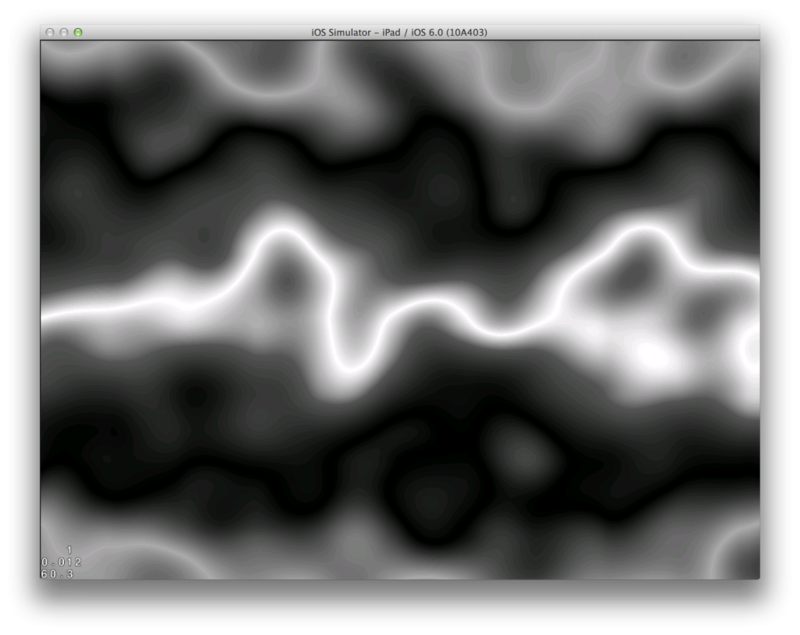 Start with a Perlin noise map that fits your needs. 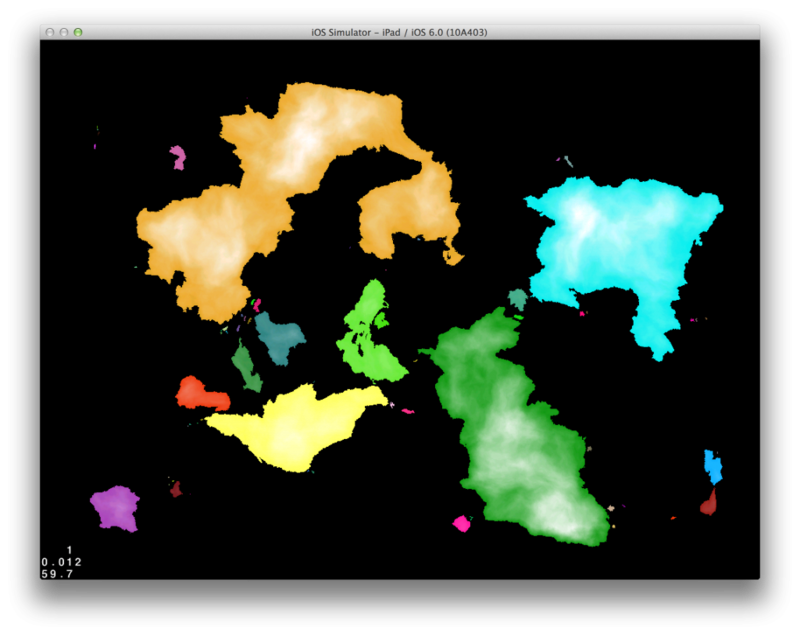 Play around with the map size and noise parameters until you are satisfied. 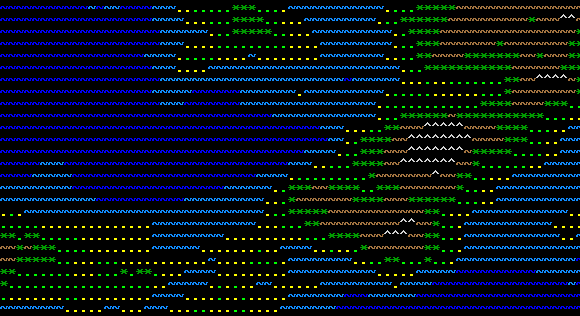 Due to the nature of the displacement, it is useful to start with a map that is tileable both vertically and horizontally, since points will almost certainly be displaced off of the map boundaries and will need to be wrapped around. We’ll need to generate two additional Perlin noise maps for displacement: one for the X values, and one for the Y. These should also be tileable to avoid any obvious seams across map boundaries, and each cell should have a value ranging from -1 to 1. If they have a value from 0 to 255, as in the ones in the demo, map them to the -1 to 1 range with the necessary arithmetic (x / 255 * 2 - 1, in this case). The one missing ingredient is the amplitude. This describes the maximum displacement that will occur for a value of -1 or 1. 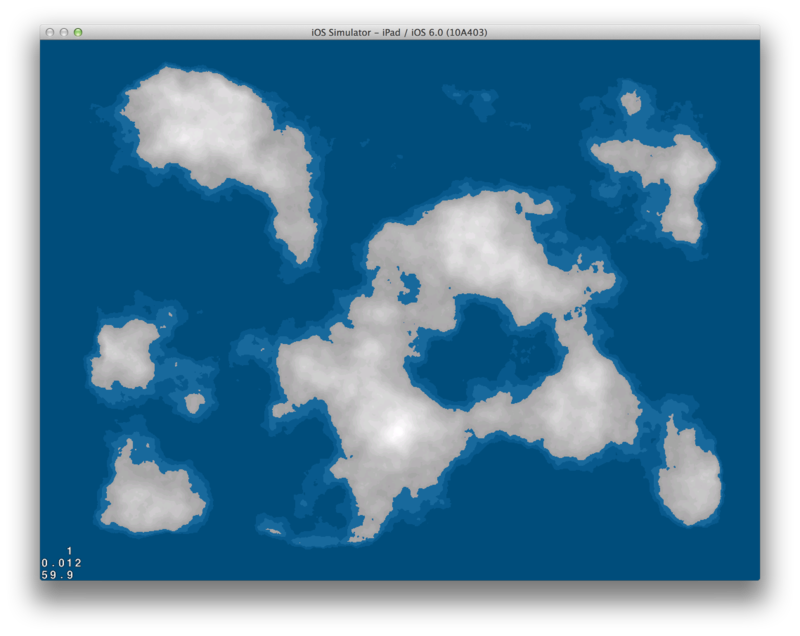 Pick a reasonable value for your purposes: from 1 to twice your map dimensions. For this demo I’ve chosen 20. Iterate through each x/y value. 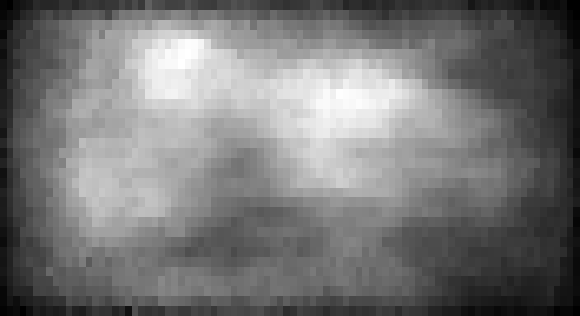 For each position, grab the corresponding value from the X displacement map and multiply it times the amplitude, and do the same for the Y displacement map. You now have two values, one for X, and one for Y, in the range (-amplitude, amplitude). These describe the x/y offset, from the current position, of the cell that will be replacing this cell in the result. So if we’re working with cell 5,10, and the offset values are -2, 9, we’ll write the value in cell 3, 19 to the result, at position 5, 10. We must also ensure that we handle offsets that reach across map boundaries: for our purposes, wrapping works well, though clamping may also give you reasonable results. 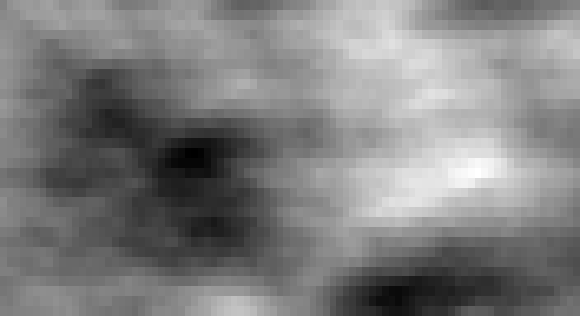 Note: I’ve chosen ranges for most values such that the demo produces satisfactory results. I encourage you to tinker with the source code such that you may explore what lies beyond these bounds! Depending on your particular needs, you may have all that you require as of this point. 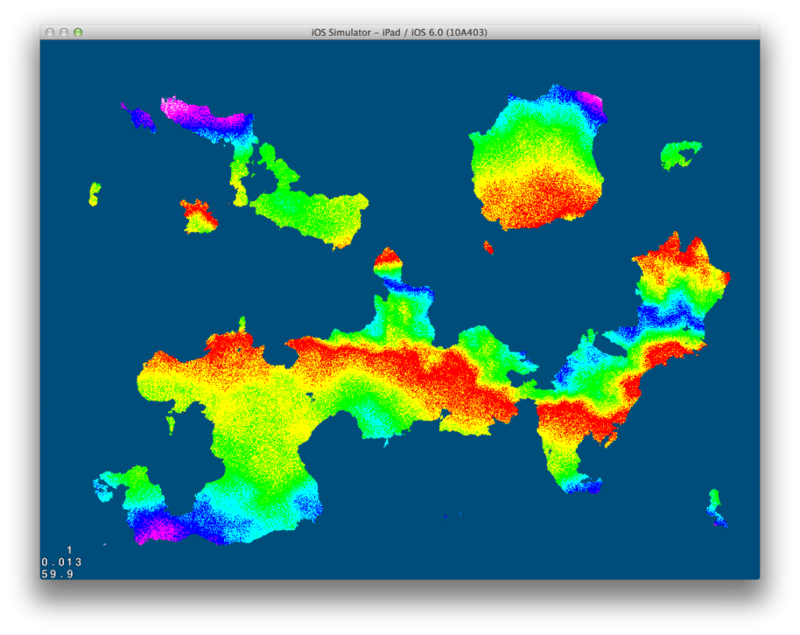 However, for our world generation purposes, we’ll take some additional steps to round out the edges of the map, pick a water line, and finally, assign some color values to different elevations so that we can better appreciate the difference domain warping makes. To pick a water line, you may be inclined to take your max elevation after you’ve normalized your maps and multiply it times the desired water cover. However, collecting all of the map’s values in a sorted list, then indexing the value at water_line_percent * list.length will provide more accurate results, since the distribution of the noise values is unlikely to be linear. 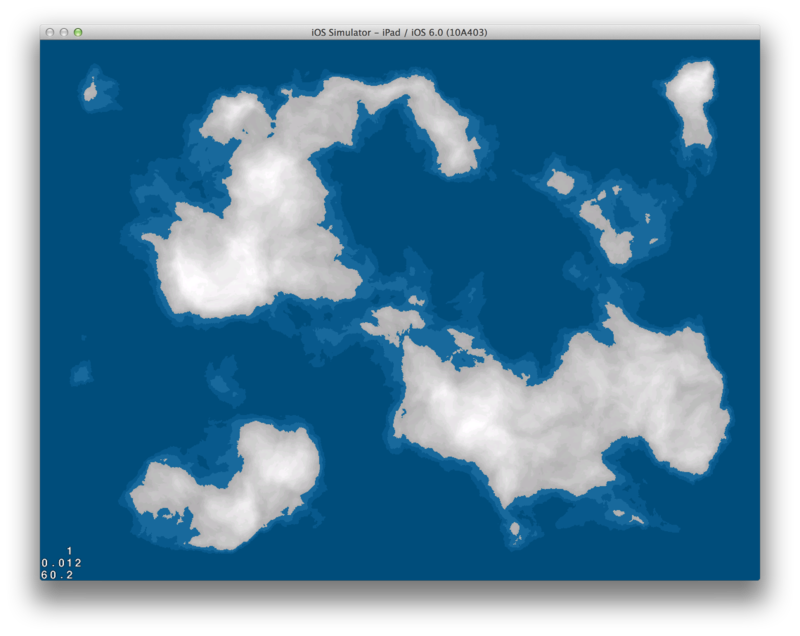 In the source code, the Map class provides a handy getElevationByPercentage() function for this purpose. 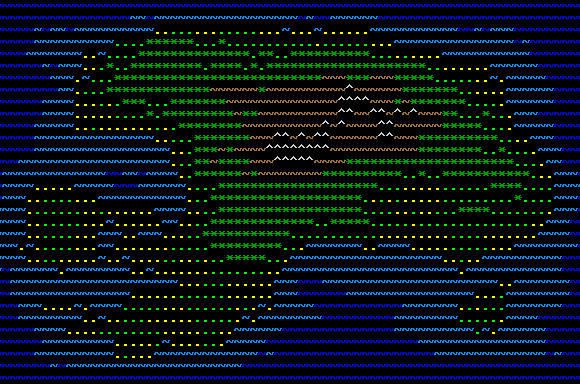 I certainly hope to see more procedurally-generated worlds taking advantage of simple-yet-effective techniques such as domain warping. The source code for all of the demos, and of course, the underlying domain warp logic, can be found on GitHub. Enjoy! Full disclosure: Chronophase is not a traditional roguelike but rather a brief exploration of what an ASCII turn-based space dogfighting game could be. The original source was built with Flash and relied on an embedded asset in the FLA, so I took a little bit of time to rework it for IntelliJ IDEA and a standalone AIR SDK compile. It should be straightforward to bring it into Flash Develop or your preferred IDE. This algorithm is rather straightforward: after picking the starting point, generate one point at a time within the container’s constraints. If the generated point is too close to its closest point, drop it. Otherwise, move it along the vector to its closest neighbor so it is a certain maximum distance away, then repeat. 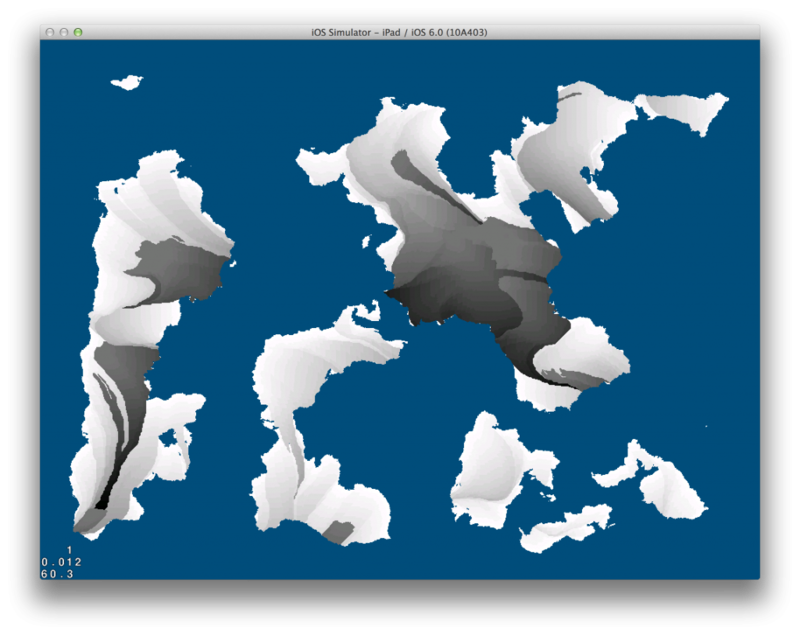 You can tame the distribution somewhat by altering the container’s dimensions, as you can see in the header image. To generate a more reliable mountain-range-like distribution, try starting with a narrow container and setting the starting position to one of the ends. The full source code is available on GitHub as well as Google Code. Enjoy! Originally named the DamerauLevenshteinNamegen, in honor of its last filter step, this generator was first written in PHP, ported to AS3 for use in Dance of Death, and now to Objective C for Crossword Dungeon. The source code is available on GitHub as well as Google Code. This is the largest part and core of this generator: we step through each name in the seed, then through each letter in that name, and keep track of how likely that letter is to follow its prior letter. 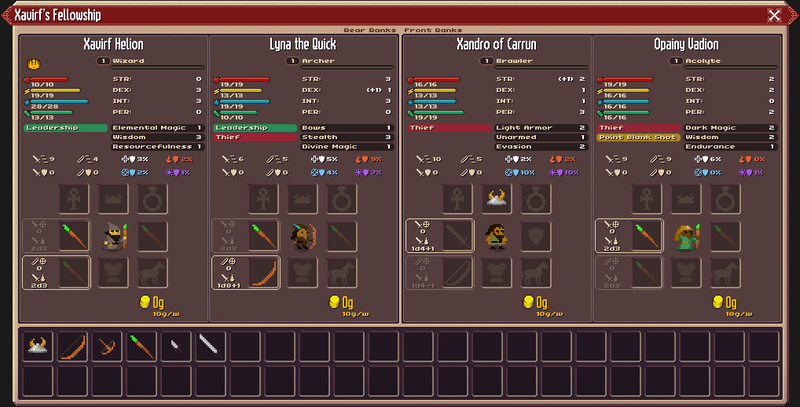 We also keep track of the sizes of the names, to ensure the generated names are consistently sized. We only need to do this parsing once (or any time the seed changes). The generated names are acceptable, but a bit weak, largely because there is no post-processing done to them, but mostly because the first and last letter do not follow the seed distribution. Even though the “Cambridge study” was bogus, there is still an intrinsic importance to the way a word starts and ends. To improve the algorithm, let’s keep track of the likelihood that a letter appears first and the likelihood that it appears last. Picking the first letter is straightforward: we track it in a weighted array and pick from that; picking the last one is not so trivial. We can pick the last letter before the name body generation loop then best-fit the penultimate letter at the end of the loop (this is the solution I went with), or we can pick the last letter within the name body generation loop by prioritizing letters with higher “lastLetter” weight when picking the last letter (you are welcome to experiment with this approach!). This is an entirely optional step, since the generator at this point is pretty solid. For some additional refinement, however, we can look to two post-process filters: triple-letter checks, and maximum Damerau–Levenshtein distance from seed names. The triple letter check is straightforward: step through the word, and ensure no three characters in a row are the same. This is a surprisingly likely occurrence if you have names in your seed with same-letter pairs, since a letter is allowed to follow itself and can do so recursively. In this implementation, this check is being done as a postprocess step, but it can also be integrated into the name body generation loop. The Damerau–Levenshtein check ensures that the generated word is close enough to at least one of the names in the seed by measuring the Damerau–Levenshtein distance of the generated name to all of the names in the seed until it finds one whose distance is below the threshold (half of the name length works well). What this means is that we want to keep the general structure of half of the generated name, with some room for letter additions, subtractions, replacements, and swaps. This check ends up filtering out names that are very off-the-wall, which you might very well want to keep; it can also be somewhat costly if you have a large number of seed names. I’ve skipped it in the Objective C version without any regrets! Grab the source code from GitHub and Google Code. Feel free to tweak any of the values and modify the algorithm; attribution’s always appreciated, but last time I released code under GPLv3 it was met with some discontent, so have fun with it and let me know in what ways you improve the system! 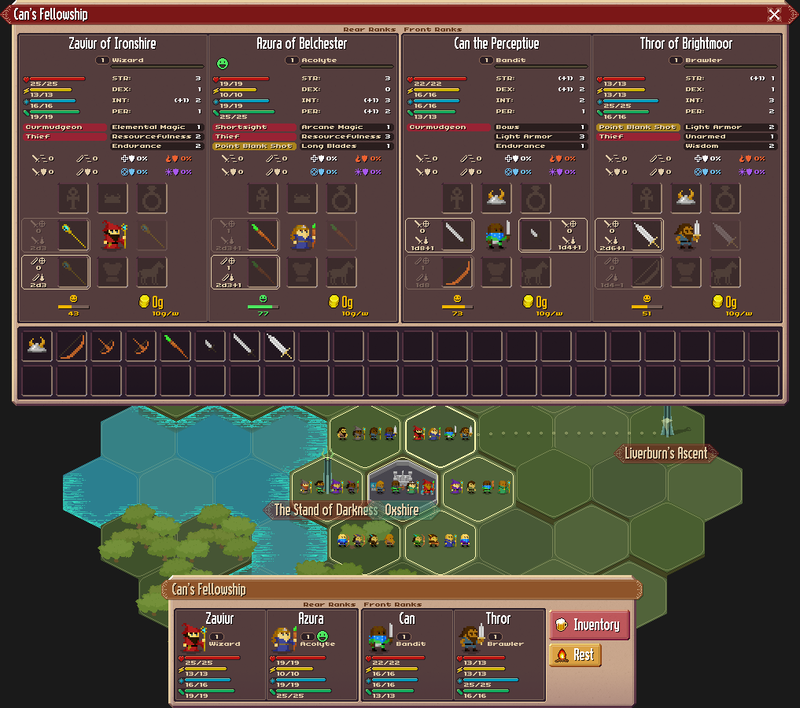 Taking an experience-first approach, I’ve focused the last chunk of work on the party inventory UI, the primary interface to equip heroes and view party composition at a glance. That gets us current! I’ll be releasing out Alpha 2 to my internal testers for some early feedback and review shortly, then will move on to the next major areas of missing functionality: XP gaining, leveling up, and city development. Lich: This late-game baddie will raise Skeleton Archers in nearby blank (or already solved) tiles! Raised Skeleton Archer: Same as the Skeleton Archer, but yields no XP. 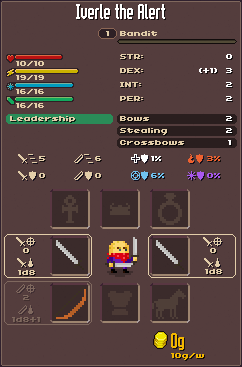 Level Up now shows two stats and two skills, and is better organized. Tip in menu detailing tap-hold to view Monster Info. Swapped order of hints, Across now shows on top of Down. Uncovered locked skill information in Character screen. You can now peek at skills for which you do not yet qualify. Monster Info shows monster XP. 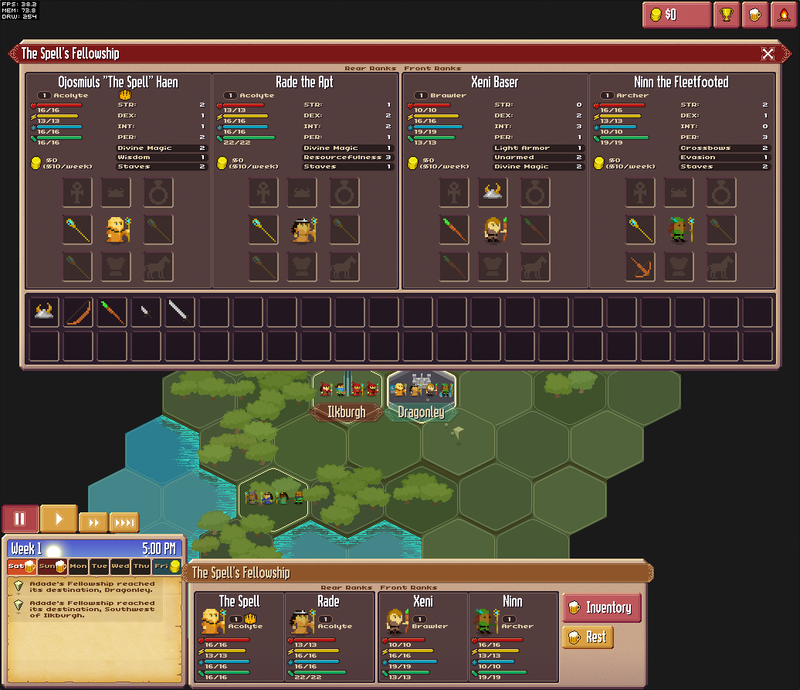 Ranged Attacks at a range larger than 1 now move at the same speed. Higher level monsters now give slightly less XP to compensate for the easier Level Up flow. Level panning threshold now slightly bigger, causing less unintended level pans. 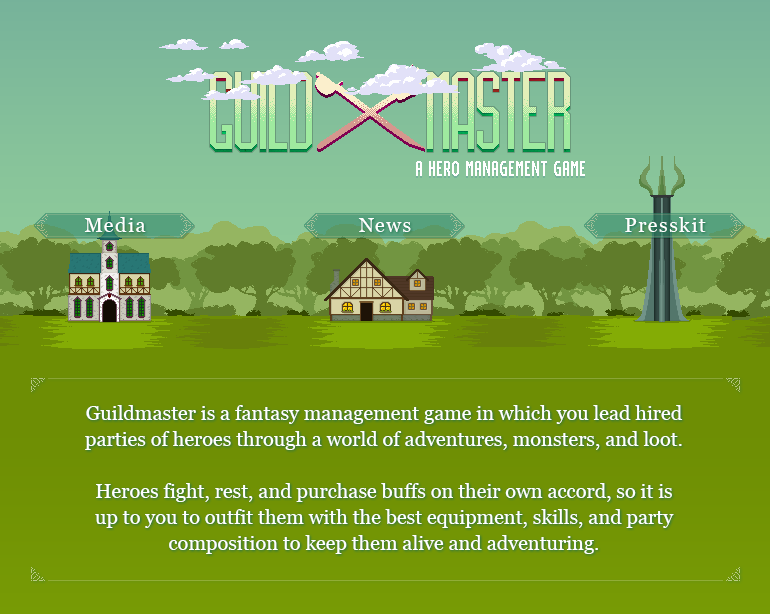 Time to tap-hold on a monster to show its Monster Info panel slightly lessened. Fixed a fatal crash caused by an improper word entry. Fixed a crash when a ranged attack kills you while descending to the next level. Fixed an issue where a Whirlwind miss would consume your Berserker Rage. Fixed a bug where Multishot could kill a monster twice and yield double XP. Please let me know if you find any issues or bugs with the game, especially on Android.